Irish Ferries accounts for January to June 2018 report that performance against the market was adversely affected by a delay in the delivery of new ferry WB Yeats and major disruption to schedules on the Dublin/ Holyhead route due to technical difficulties affecting the flagship vessel Ulysses. 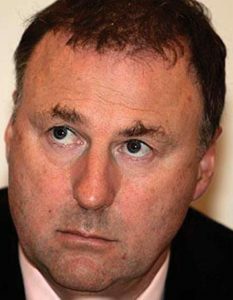 It is estimated the WB Yeats delay cost €7m and the Ulysses disruption cost €6m, both to be taken in H2. Ulysses’ starboard controllable pitch propeller required an out of schedule drydock and the lead-time to machine specialist parts. Irish Feerries aid this level of cancellation was unprecedented given that vessel’s previous 99pc schedule integrity since entering service in 2001 to 2017. Irish Ferries say that while they took undertook mitigating actions to reduce the effect of the disruption by rescheduling other vessels in its fleet, the disruption resulted in a significant reduction in Irish Ferries Ro Ro capacity in June. 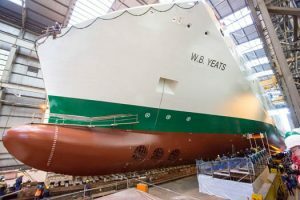 The WB Yeats, a cruise ferry currently under construction by FSG, was due to enter service with Irish Ferries during July to provide enhanced services on the overnight Dublin Cherbourg route. This vessel was launched on schedule on 19 January. Due to extraordinary circumstances beyond the Group’s control, the subsequent delivery of the WB Yeats has been delayed by FSG. This necessitated Irish Ferries cancelling until further notice the 2018 schedule of this vessel due to the unavailability of a suitable alternative vessel. Irish Ferries very much regrets the inconvenience these cancellations caused our customers 88pc of whom were accommodated on alternative Irish Ferries sailings or via landbridge. The Group has not yet received a reconfirmed delivery date but the expectation is that the vessel will be delivered in late 2018. All contract payments made to FSG are covered by financial guarantees with 80pc of the contract price not becoming due until delivery. The performance of the Ferries Division in the second half of 2018 up to 25 August has been significantly affected by the major disruptions to schedules on the Dublin to Holyhead route during July. The Ulysses missed 5 weeks of summer service due to technical issues with 4 of these weeks falling into the second half of the year. The disruption not only affected Irish Ferries carryings but also the overall performance of the tourism markets due to capacity constraints in what was the peak car tourism period. The released accounts are quite complex due to sales of vessel in previous periods, one of which had used to earn significant lease income. Total revenue was up 0.7pc at €157.2m, but cash earnings (EBITDA pre asset sales) were down 11.8pc at €26.1m, largely due to the lower lease revenue. Freight traffic and port business showed increased volume but cars and passengers carried were down 2pc and 3pc respectively. The Board has declared an interim dividend of 4.21 cent per ICG Unit compared with 4.01 cent last year.